This week on Exploring Japan, we return to the northern part of Kanto with Ibaraki Prefecture. The population of Ibaraki is fairly stable, though some cities are decreasing in population. Others, such as Tsukuba, are growing quickly. Ibaraki is also often mispronounced as Ibaragi. I hear it all the time. But it is Ibaraki. Sakasai Castle is in Bando city, and is a rather recent reconstruction. Apparently, it’s a pretty nice looking reconstruction, though not terribly impressive as far as size goes. But it seems interesting. Also, it isn’t easy to access. Tsuchiura Castle in Tsuchiura doesn’t have much, but there is a gate still remaining. Kasama Castle in Kasama has a couple gates and a turret remaining, but not much else. However, it seems that some money has been allocated to do a survey of the castle grounds. Ibaraki surprisingly has very little left in terms of castles. Most have been almost completely destroyed. In J League soccer, there are 2 teams in Ibaraki. They are Kashima Antlers in Kashima and Mito HollyHock in Mito. Ibaraki always seems to me to have few things to see and do. I know about Mt. Tsukuba, which I’ve wanted to hike up, but that’s about it. But there is more! Mito, the capital city, has a lot of historic sites. It’s home to the Mito Domain, with the very influential Tokugawa Mitsukuni (or Mito Komon) as the daimyo. There’s a very well-known samurai drama on TV in Japan about him. In Mito, there’s a Mito Komon Festival. Kairakuen Garden is one of Japan’s top 3 gardens, and is the major sight in the city. It includes the Kobuntei, historic samurai residences, as well as Tokiwa Shrine. In the shrine, there’s a small museum called the Giretsukan. Mito Arts Foundation has a tower that commemorates the city’s 100th anniversary. The Tokugawa Art Museum houses art from the clan’s collection. Kashima city is famous for its Kashima Shrine. Tsukuba is known for its mountain, Mt. Tsukuba, which you can hike. At the foot of the hiking path and cable car station is Tsukuba Shrine. Along the way to the top of the mountain, there’s a large stone Buddha, but it’s on one of the longer trails. At the top of the cable car, there are several shops and restaurants, while the summit is a short hike away. The twin summit has a shrine and a frog-shaped rock. In the city, you can visit the Tsukuba Space Center, which has free tours. I really want to see that! Tsukuba city is a planned city that was designed to focus on scientific research, a project called Tsukuba Science City. Probably the most famous food to come out of Ibaraki is natto, sticky and smelly fermented soy beans. It’s popular in the Kanto region, but not so popular elsewhere in Japan. Have you visited Ibaraki? What else would you recommend? Exploring Japan goes down to the Kansai area now with a visit to Hyogo Prefecture. Hyogo has a slowly decreasing population, although Kobe and Nishinomiya are growing. Himeji Castle is the castle to see in Hyogo, and quite possibly all of Japan. It is probably the most famous castle in Japan, and it’s the best original castle. It’s currently undergoing renovations until March 2014. It is a must see. Akashi Castle in Akashi city is an original, although it never had a central tower. There are two remaining turret towers, though. Also, there is a base for the central tower, which was never built. Ako Castle in Ako city is a partially reconstructed seaside castle. There is no central tower, and it isn’t impressively big. Some of the reconstructions were recent. Izushi Castle in Izushi is mostly ruins, but some parts were rebuilt. There’s a clock that was placed in the castle grounds, which is now a symbol of the town. Sasayama Castle in Sasayama is another castle that never had a main tower. Most of the buildings were destroyed, but the main hall was rebuilt in 2000. Sumoto Castle in Sumoto on Awaji Island is a reconstruction made of concrete. Kobe has several sports teams, including two professional baseball teams. The very popular Hanshin Tigers are based in Nishinomiya, while the Orix Buffaloes are based in Kobe. In J-League soccer, Vissel Kobe is based in Kobe. Hyogo has a lot to see and do, and probably the biggest thing to see is Himeji Castle. I’ve seen a lot of pictures of Kobe Port, which I’d love to walk around. Kobe is a major tourist destination, and being very international, has some international sights. Ijinkan is the foreign residences from the 19th century, and they’re built in different styles. Likewise, Kyu-kyoryuchi near Motomachi has a lot of 19th century buildings that are now restaurants and shops. Meriken Park is a memorial to the Great Hanshin Earthquake of 1995 and it features Kobe Port Tower, with a great view of the city. City Hall Observation Deck also has a good view. Chinatown is another popular place with plenty of Chinese food. There are several parks, including the Fruit Flower Park and the Nunobiki Herb Park. Sorakuen Garden is a nice Japanese garden in central Kobe. There are also many sake museums and breweries to visit, such as Sawa-no-Tsuru Museum, Hakutsuru Sake Brewery Museum, Hamafukutsuru-Ginjo Brewery and Shop, and Kiku-Masamune Sake Brewing Company. You can also visit the Oji Zoo. Mt. Rokko has a rock garden and a great night view of the city. Nunobiki Falls are one of the most important waterfalls in Japan. I’d also like to see Ikuta Shrine, one of the oldest in the country. Akashi has a couple of things to see. One is the Akashi Planetarium. Another is the Akashi Brewery, which makes Akashi Beer. The beach is known to be relaxing and not very busy. Himeji has a lot of history to see. In addition to Himeji Castle, there are plenty of other places to see. Kokoen Garden is a beautiful Japanese garden that was created in 1992. Hyogo Prefectural Museum of History is a good place to see Japanese history. Himeji City Museum of Art features some local artists, while the Himeji City Zoo has various animals in small enclosures. Senhime Shrine gives a great view of Himeji Castle, while Engyoji is a beautiful temple. Tegarayama Botanical Garden has a small aquarium. There are plenty of festivals, but hanami (cherry blossom viewing) features koto and taiko performances. Nishinomiya is between Kobe and Osaka, and is really famous for one thing: baseball. Koshien Stadium is home to the Hanshin Tigers, and also hosts the National High School Baseball Championship, which is a really big deal in Japan. Hyogo Performing Arts Center shows a large variety of performances. Manchidani Park is well-known for its cherry blossoms in spring, and is also featured in the novel Grave of the Fireflies. I’d like to see Hirota Shrine, Nishinomiya Shrine, and Kannoji Temple. Takarazuka city is famous for a couple of things. Takarazuka Revue is a famous theatre group that features female actresses in all of the roles. It is famous across the country. Also, it has the Tezuka Osamu Manga Museum, dedicated to the “Father of Anime.” The Takarazuka Gala Fireworks Festival is one of the oldest fireworks displays in Japan. Nakayamadera looks like a nice temple. Awaji Island is a well-known island that features a fascinating natural phenomenon. The Naruto whirlpools are accessible from the island. Akashi Kaikyo Bridge is the world’s longest suspension bridge, and it joins Awaji Island to Kobe. Kiseki no Hoshi Botanical Garden is apparently quite beautiful. Nojima Fault Preservation Museum is dedicated to preserving a section of the Great Hanshin Earthquake of 1995. Probably the most famous food out of Hyogo is Kobe beef. This famous beef is known for its marbling and taste. It’s fairly expensive. I have seen wagyu beef (Kobe is a variety of wagyu) in the supermarket, and it is pretty expensive. Exploring Japan returns to the northern part of the country, this time with Hokkaido. Hokkaido’s population is dropping, as are most of the cities in the prefecture, but Sapporo and Tomakomai have increasing populations. Matsumae Castle is the only castle in Hokkaido, and it’s located in the town of Matsumae. It is the youngest traditional castle in Japan, though what you see is a reconstruction. Hokkaido has plenty of professional sports to watch. In baseball, they have the Hokkaido Nippon-Ham Fighters in Sapporo. In J-League soccer, there is Consadole Sapporo. And then, in the Asia League Ice Hockey, there are the Nippon Paper Cranes in Kushiro and the Oji Eagles in Tomakomai. Hokkaido is one of the best destinations in Japan for nature, hiking, and skiing. Shiretoko National Park is a UNESCO World Heritage site and one of the most remote areas in Japan. Sapporo hosts the Sapporo Snow Festival with many ice sculptures. These are two things I really want to see. Sapporo is one of the largest cities in Japan. The Tokeidai (Clock Tower) is the symbol of the city, but it is also considered one of the most disappointing sights in Japan. Odori Park is a very long park running through downtown Sapporo. At one end is Sapporo TV Tower, a copy of the Eiffel Tower with an observatory. You can also do some beer tasting at the Sapporo Beer Museum. Hokkaido Pioneer Village shows what Sapporo was like during the industrial age. The 100th Anniversary Memorial Park has a tall tower that can be climbed and provides a good view of the area. Asahiyama Park has a beautiful garden and has a great view of the city. JR Tower has a good view of the city, and it even has a men’s room with a view! For art lovers, you can see the Hokkaido Museum of Modern Art and Sapporo Art Park. Moerenuma Park seems like an interesting park with a glass pyramid. For more gardens, the Hokkaido University Botanical Garden is good to see. Finally, the Hokkaido Shrine is a big shrine that would be worth seeing. Abashiri is a northern city with some interesting looking museums, including the Abashiri Prison Museum and the Museum of Northern Peoples. Asahikawa is Hokkaido’s second largest city, but also the coldest in Japan. It’s home to Asahiyama Zoo, a zoo famous for its penguins, bears and seals. The Otokoyama Sake Brewing Museum is a good place to do some sake tasting. Asahikawa Winter Festival is Hokkaido’s second biggest festival, but has the largest ice sculptures. Furano is located in the centre of the prefecture, and is famous for its incredible skiing conditions in winter and its beautiful lavender fields. Also, for some locally made wine, there’s the Furano Winery. Hakodate is one city that I really want to see. It’s known for its amazing view of the city from Mt. Hakodate. Both day and night views are incredible from the pictures I’ve seen. On the mountain, there’s also Tsugaru Fort, a World War II battery. Fort Goryokaku is Japan’s first western style fortress, so it’s not quite a castle. Goryokaku Tower has a great view of the area. Motomachi is the historic area with a lot of European style buildings, churches, and former consulates. Red Brick Warehouses were built at the end of the Meiji Era and have some good seafood restaurants. Kitami isn’t a major city to visit, unless you really like peppermint. They grow it there. Nemuro is the easternmost city in Hokkaido, and has some sights, such as lighthouses and a wild bird sanctuary. But the reason to go here is food. It apparently has some of the best seafood in Hokkaido. Obihiro is a city that can mainly be used as a gateway to other destinations. There are a lot of dairy farms, if you’re interested in that. But the big draw is the trekking and hiking opportunities at Mt. Hidaka and Mt. Daisetsuzan. Otaru is an interesting place, I think. A big feature is the scenic Otaru Canal, which is lined with gas lamps that light up at night. The Otaru Music Box Museum has plenty of music boxes. Just outside is a Steam Clock given to the city by Vancouver. You can also blow your own glass in the city. Wakkanai is Japan’s northernmost city, and that’s mainly what it’s famous for. There are some sights, though. Wakkanai Park sounds nice, and it has the Motoe Hiraku Centennial Memorial Tower with its view of the cape, Rishiri volcano, and sometimes even Sakhalin. Cape Soya is the northernmost point on Hokkaido. To see some animals, you can visit the Harbour Seal Observatory, Lake Onuma Bird Observatory and the Noshappu Cold Water Aquarium. Niseko is a town that’s famous for its ski resort. Noboribetsu is a city that’s known for having the largest hot spring in Hokkaido. It’s a hellish-looking place. Akan National Park is known for its calderas and clear lakes. Daisetsuzan National Park is famous for its volcanoes, wildlife, and very rugged hiking. It’s Japan’s largest national park. Shikotsu-Toya National Park is a very popular national park that’s famous for the caldera Lake Toya. Hokkaido is considered to have some of Japan’s best food. It has the best seafood, including crabs, shellfish, sea urchin, and it has great sushi. It’s also an agricultural area, so dairy products are famous. It also has its own variety of ramen. Have you been to Hokkaido? What do you recommend? Exploring Japan is now going to the Chugoku region, the westernmost part of Honshu, with Hiroshima Prefecture. The population is slowly decreasing, though Hiroshima city’s population is increasing. Hiroshima Castle is a reconstruction, since the original was destroyed in the atomic bombing in 1945. It’s a concrete reproduction, though some more recent work is done using traditional methods. It’s now a museum for Hiroshima’s pre-war history. Fukuyama Castle in Fukuyama was a huge castle, though it was destroyed in World War II. It’s a reconstruction now, and it serves as a history museum. Hiroshima has 2 major professional sports teams. For baseball, there’s the Hiroshima Toyo Carp, and for J League soccer, there’s Sanfrecce Hiroshima. Hiroshima is famous for two major things. Of course, the world’s first atomic bombing on a city happened at Hiroshima city, so there are many sights related to that, including the Genbaku Dome, or Hiroshima Peace Memorial. Nearby is the island of Miyajima (Itsukushima) with it’s very famous and often photographed Itsukushima Shrine. Both locations are very important national treasures in Japan, while the Hiroshima Peace Memorial is a UNESCO World Heritage site. Hiroshima is a major tourist destination in Japan for obvious reasons. The city itself is rather typical of Japanese cities as far as appearances go. The most likely place anyone will visit is the Peace Memorial Park, which has many things to see. In addition to the Genbaku Dome, you can also see the Children’s Peace Monument, the Hiroshima Peace Memorial Museum, and the Hiroshima National Peace Memorial Hall for the Atomic Bomb Victims. There are an incredible number of monuments in the area. Too many to list. In addition to the castle and Chuo Park, which surrounds it, there are other things to see. The Hiroshima Children’s Museum, a science museum with a planetarium, and the Hiroshima Museum of Art could be good to see. Another museum is the Hiroshima City Manga Library. Fudoin is a temple that survived the bombing. Mazda’s headquarters are near Hiroshima, so there’s also the Mazda Museum. Mitaki-dera is a beautiful temple with three waterfalls. Shukkeien is a very beautiful Japanese garden that’s considered one of Japan’s best. Hiroshima has plenty of festivals to see, too. There’s the Peace Memorial Ceremony, of course. The Flower Festival is a major festival with live performances. And then there’s the Food Festival, which has a lot of food for you to eat. Fukuyama, Hiroshima’s second city, also has plenty to see. Tomonoura is a very scenic port area with several temples and shrines. Myooin is a major temple with a 5-storey pagoda. Kusado Sengen is a medieval town that was excavated. The city has an annual Rose Festival, as its city flower is the rose. Hatsukaichi, near Hiroshima, is the city famous for Miyajima and the Itsukushima Shrine. It’s an absolutely beautiful shrine built on the coast, and it appears to be floating at high tide. It’s a must see, I think. Miyajima has more than just the shrine. The Marine Plaza Miyajima is an aquarium. You can also see the Miyajima Natural Botanical Garden on the island. There used to be a castle on the island, Miyao Castle. You can visit the ruins there. In August, you can see the Miyajima Underwater Firework Festival. Higashihiroshima isn’t famous for much, but it does have a festival that sake lovers will want to see. It’s the Sake Festival in Saijo. Kure is known for its link to the sea and shipbuilding. You can visit the JMSDF Kure Museum, showing the history of the Japan Marine Self Defence Force, as well as the Kure Maritime Museum (also known as Yamato Museum) which features a 1/10 scale model of the battleship Yamato. Mount Noro is a good place for hiking and enjoying nature. Miyoshi is a small inland city that features the Origami Museum. Mihara city is known for the Buttsuji temple, and also has the ruins of Mihara Castle. The destruction of this castle is a bit unusual. It was demolished to make space for a train station in the late 19th century, and in 1975, the entire site was split in half by a shinkansen station. Onomichi is a beautiful city filled with many temples and shrines. I can’t list them all, but here are some major sights. Senkoji Park is on Mt. Senkoji, and is well-known for its cherry blossoms. On the hill is Senkoji, a historic temple. Jikoji is a temple where you can make your own little Buddha statue. Tenneiji is a temple that has 500 statues in its main hall, and nearby is the Maneki-neko Museum, dedicated to the lucky cat. Saikokuji has a beautiful red pagoda. Jodoji is a temple that was founded more than 1400 years old. If you like art, you can visit the Onomichi City Museum of Art. Hiroshima is famous for a very popular kind of food, Okonomiyaki. It’s similar to a pancake, but it’s filled with vegetables, meat, seafood, and pretty much anything you’d like to include. Hiroshima’s okonomiyaki is layered, and contains a large amount of ingredients. Have you been to Hiroshima? Leave a comment with your recommendations. After nearly 40 straight hours of constant rain, the sky began to clear up in the afternoon. The air was absolutely clear. What does that mean? A very clear view of the Tanzawa Mountains and Mt. Fuji. I took this picture from work today, and it was incredible to see. Mt. 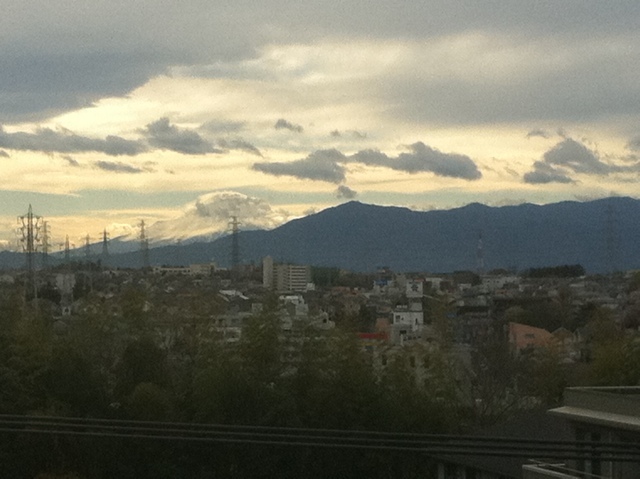 Fuji was capped by clouds, but you can see that it’s still covered by snow. It’ll be a while until it’s snow-free. I love being able to see Mt. Fuji regularly.